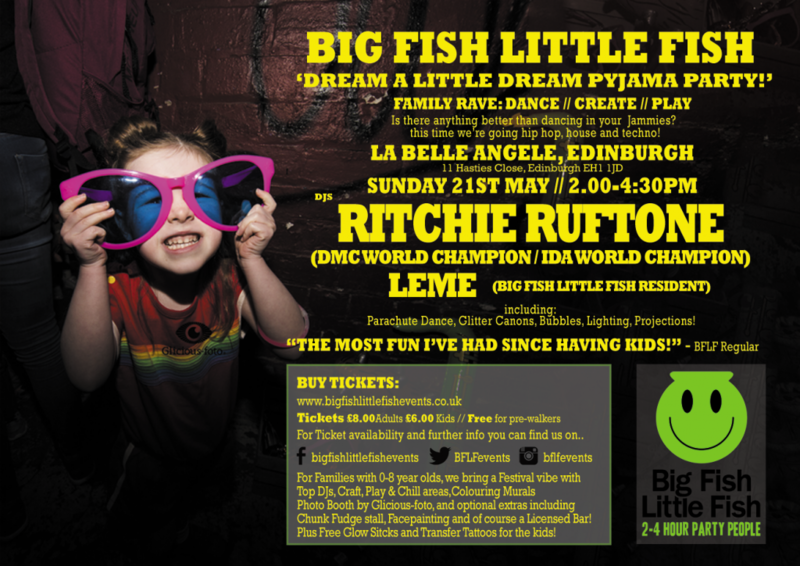 The Big Fish Little Fish Scotland Crew are pleased to announce that we will be returning to ‘La Belle Angele‘ on the 21st May 2016. After sell out events in March and April we want to keep the rave going and we have already got one top party lined up for you, still with every bit of what makes Big Fish Little Fish so great.. Quality DJ‘s, Upfront and Classic Tunes, and a fun festival vibe and environment that we can all enjoy, ravers of all ages..
Dance: Joining us this time around we have a DJ who knows a lot about performance, with prestigious ‘world champion‘ titles earned with such major bodies as DMC and IDA we are super excited to have turntablist legend Ritchie Ruftone come and join us for what we feel will be an awesome show, if you haven’t witnessed a turntablist before you’re in for a real treat. As ever we will have our multi-sensory dancefloor, with glitter cannons, bubbles, our giant parachute dance, Lighting, and projections!. we just know you’re gonna dig this!